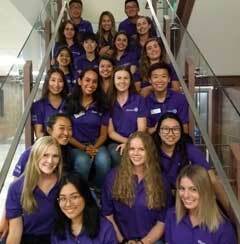 Welcome to Western's Off-Campus Advisors! The OCA Program is an extension of the Housing Mediation Services at Western University. The Off-Campus Advisors are a group of students employed by Western University. We exist to help students and their neighbours deal with issues related to living in the community. We are trained to provide assistance, information and support to students facing issues such as landlord or renting problems, bylaw questions, roommate disagreements and any other issue or concern that may arise when students are living off-campus. Our mission is to provide all on and off campus students, as well as the surrounding community, information so that they understand their personal rights and responsibilities as well as those of their landlords, neighbours and peers. We will do all that we can to be a known asset of UWO - one that will assist in mediation awareness, support and act as a liaison between students, administration, and the community.